What interested me as I skimmed the copy about the painting was finding he developed more than one version of it. I don’t remember, any more, exactly what I read, but there were two different reproductions, both of which appeared to be finished works. He painted the initial version, but not being satisfied with it took strips of colored paper and applied them to the canvas to alter the composition, who knows how many times. That wasn’t mentioned in the copy, but he could have set aside the original canvas (as a finished painting) and started a new one, the final and second version. 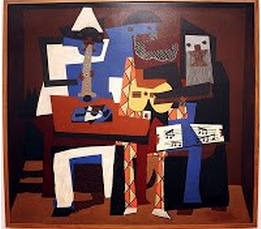 In this painting, which hangs in the Museum of Modern Art in NYC (pictured), one can make out the parts or a silhouette of a dog under the bench where the three musicians are seated. This is what started me thinking in relation to my creative writing assignment. 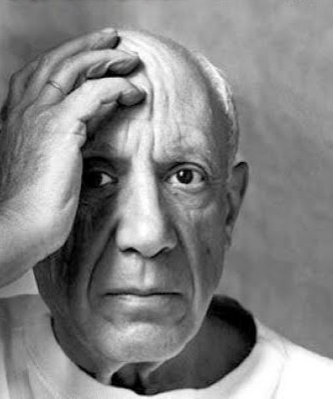 Picasso had brought a new dynamic (for me) to Cubism as a style, which at this time (1921), was in vogue. The style and technique fascinated me and I had the idea to make an innovative change to my poem as the idea fermented in my mind as it related to my assignment. 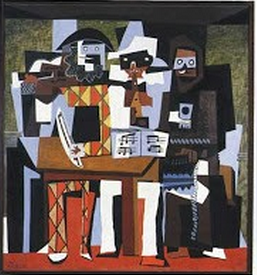 Why not have the three musicians exchange thoughts and ideas as well as play their instruments? It could be a fun game and a challenge. Note: I have since discovered that the other version hangs in the Philadelphia Museum of Art. Yes, conquered the world he has, Monsieur Monk. Good gentleman, play praises we will to him. Play my horn I will, Monsieur Harlequin, to him. “But wait! We will join together, together we shall praise. Monsieur Monk, is your concertina tuned? Follow closely the tones We will play together. GREAT IS OUR MASTER; he enslaves world. Together we will praise him. Can you not see the tones properly before you, Monsieur Monk? Monsieur Pierrot, It is my difficulty truly to blame, My waist-cord fouled a key. The tone must be so, The rhythm unique, the space plastic. Gentlemen, this discord must be righted right. POWERS AND TIMES ARE NOT GODS, MY FRIENDS, LET US ACKNOWLEDGE WITHOUT DESPAIR, NOT IN OUR FUTURE, BUT IN FULLNESS OF TIME. “My notes are down-side-up, Peirrot. We are rapidly arming to this advantage. Our empire shall be secure, Peirrot. “Last night it was old. Then new this morning…tomorrow it can not be less.